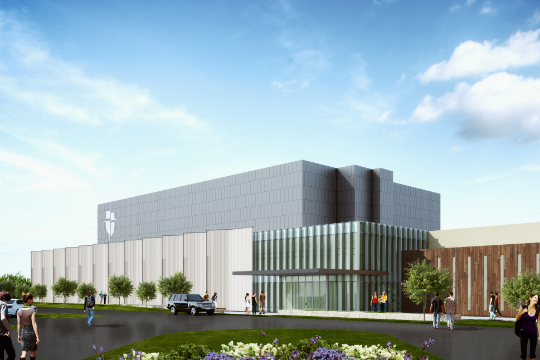 For a glimpse into the vision behind the Performance & Community Center (PACC), we sat down with Andrew Bennett, a principal of BOKA Powell, the award-winning architectural design firm also behind the Gene E. Phillips Activity Center now under construction. BOKA Powell has created architectural and interior designs in North Texas for four decades. Their work includes the Omni Dallas Convention Center Hotel, the One Victory Park office building and the striking Perot Family Offices on Turtle Creek, as well as projects for educational institutions like Southern Methodist University, St. Rita Catholic Community, Texas A&M and Texas Tech. Why do you think Parish students and families should be excited about these new buildings? It’s that quote from that movie Field of Dreams, “If you build it, they will come.” If you have flexible facilities that give you opportunities for, in this case, kids to experiment and try different experiences, it’s going to create some really magical things. When you give a kid a canvas to play on, it provides a place to create and express themselves. That’s important, because everyone, no matter what your ultimate career path, needs to have creative outlets. It makes your life richer. How did you collaborate with Parish on the designs of the PACC and Gene E. Phillips Activity Center? There was a lot of energy in our collaboration with Parish. Dave Monaco [Allen Meyer Family Head of School] has a strong vision for the School and the role its buildings can play in fostering education and the flow of ideas. We listened closely to Dr. Karl Reiss [Director of Visual & Performing Arts] too, who knew what practical and technical elements are needed to grow the School’s fine arts programs and stage some spectacular events. You also have a sophisticated building committee with some very intelligent people who helped shape the master plan. As we worked through budgets, locations and construction methodologies, they were good stewards of ensuring the School’s long-term vision is met. What inspiration did you take from internationally renowned architect I.M. Pei’s design of the existing Midway campus building? I.M. Pei is a modernist architect who uses a lot of large-scale geometric designs that interplay with light. You see that in the original building at Parish, which he designed for Exxon back in the 80s, as well as in other buildings he has done – the Meyerson Symphony Center or the Louvre’s glass pyramid, for example. We wanted to reflect the geometry of the existing tower and Great Hall, but also the very simple, minimalist materiality. Of course it was the 80s then, and now in the 21st century we have the luxury of some higher-tech construction practices, as well as some textured concrete that is more expressive. What are your favorite features of the two buildings? In the PACC, we created a gallery, or walkway, along the eastern face to connect the lobby of the main building back to the performance area. There’s verticality and daylight in that walkway that creates some drama reminiscent of the Great Hall in the main building. If I was a student at Parish, the Great Hall space would amaze me. It is a very evocative space. The Activity Center is a different kind of building altogether. It is practical and very simple, specifically so it can accommodate a variety of activities without a lot of clutter or distraction. I like that we were able to add some natural light on the south side of the building that will enhance the experience there. BOKA Powell designed numerous education buildings. What do you enjoy most about designing for schools and universities? Working with schools is pretty rewarding, because you’re affecting an environment where minds are being shaped. We’ve designed buildings where kids have studied and lived before, and some of them have even come to work for us as architects. It’s exciting to see that come full circle, and we look forward to seeing how that manifests with Parish students.